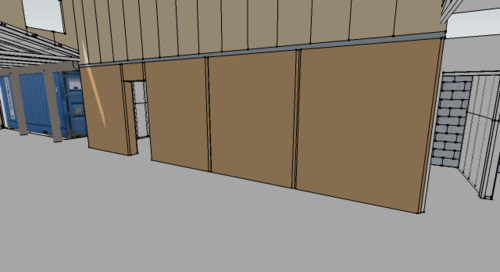 After discovering (well, more .. experiencing) that things don’t always work in the real world they way you expect them to in your head, I decided to spend some more time in Sketchup and plot some of the finer details of the work I’ll soon be undertaking. One of the things I’ve been doing is going over in my head the different methods for forming up and constructing the rammed earth wall. Having never done this before and only really getting one chance to get it right, I’ve been doing a lot of research and reading into rammed earth projects that others have undertaken. I found one such project over on a forum that Terry commented on a few posts ago, BYOHouse. This is a fantastic little forum, very low traffic but the folks there are real Aussie owner builders and share some absolute pearls of wisdom. Alissa had pointed me at this as well some time ago, but my memory being what it is I discovered it again for the first time. This will allow me to attack the wall piecemeal, perhaps one panel per day (or more likely, weekend) without needing to enlist a small army of volunteers to get it done.